Watermark on pdf file integrated with simple design. Application support several watermark like text, image, copyright symbol, page number, stamp, file name, company logo, web url, date, time, signature and more. Tool allow to set watermark into different position like right, left, top, bottom, middle, center and corner. You can set watermark on pdf first page, last page, odd page, even page, all page and custom page. Tool allow to resize image you can be use original size, fit to page size and custom size of image. You can set font style and color of applicable watermark. Utility permitted to change meta properties like title, author, subject and keyword. 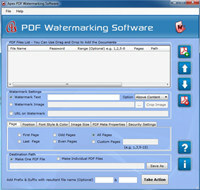 You can be protecting watermarking pdf file through user and owner password. Apex Watermark on PDF File is an utility that works under windows xp, windows vista and windows 7. It supports both 32-bit & 64-bit windows editions, therefore it could run faster on 64-bit computers. Estimated download time for Apex Watermark on PDF File on a common adsl connection is less than a minute. Version 2.3.8.2 was released one thousand eight hundred days ago by Watermark on PDF File. Click the green download button to download it now.